What you're looking at above is the exact moment that atoms for a covalent bond. 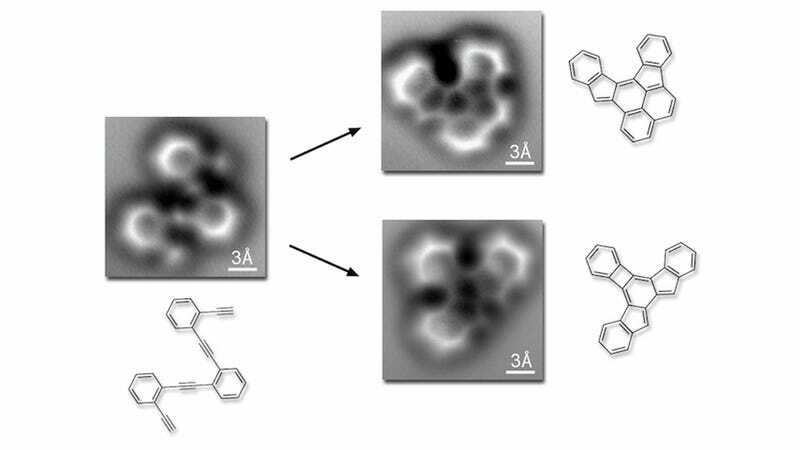 It's the first time this intricate single-molecule transformation has been captured in the act. It's a breakthrough, it's informative, in many ways it's beautiful. And it was taken by sheer dumb luck. As reported in this week's Science Felix Fischer and his team at the Department of Energy’s Lawrence Berkeley National Laboratory had set out to do what any enterprising young molecular chemist is doing these days: Create nanostructures made out of graphene, the wondermaterial of our times. Graphene, as you may remember, is made up of carbon atoms that have been arranged in a hexagonal pattern that, combined, creates a substance with near-magical properties. If carbon atoms are Planeteers, graphene is Captain Planet. Reordering atoms can be a tricky business, though; you can end up with any number of molecules in the process. So the team decided to get a closer look at the proceedings. A much, much closer look. As Wired reports, Fischer and friends bummed an atomic force microscope off of Berkeley physicist Michael Crommie, which was able to capture atom-level images of carbon falling in line. And, as it turns out, something that had never been seen before: The shared electrons that create the bonds between them. And so they joined a long, noble tradition of making scientific discoveries by complete accident.